Summer movie season starts before summer itself does, but the first blockbuster release of actual summer is Jurassic World: Fallen Kingdom (June 22), the sequel to the 2015 juggernaut, and those pesky dinosaurs are on the loose again. Horror fans can look forward to The First Purge (July 4), the fourth film in the low-budget series and a prequel to the entire saga. Marvel's third feature of 2018, Ant-Man and the Wasp (July 6), brings back Paul Rudd as the world's most diminutive superhero. The disaster film Skyscraper (July 13) answers the timeless question, "What if The Towering Inferno had starred Dwayne Johnson?" Meanwhile, the musical sequel Mamma Mia: Here We Go Again! (July 20) asks, "How much ABBA is too much ABBA?" Tom Cruise continues to up the ante on death-defying stunts in Mission: Impossible — Fallout (July 27), the sixth entry in the long-running series. The Meg (Aug. 10) fills the void left by the end of the Sharknado franchise, with Jason Statham menaced by a prehistoric shark. The already-controversial farce The Happytime Murders (Aug. 17) is an R-rated crime comedy starring Melissa McCarthy and a bunch of NSFW Muppets. As far as summer movies are concerned, the bigger and louder it is, the better. Of course, there's nothing inherently wrong with pyrotechnics and special effects, but sometimes you've got to take a break from the CGI-heavy razzle-dazzle and indulge in something that was made on the fringes of the Hollywood system. Won't You Be My Neighbor?, Oscar-winning documentarian Morgan Neville's acclaimed profile of Fred Rogers and his influential approach to children's entertainment; it's scheduled to open in Spokane on June 22. Musician Boots Riley's directorial debut Sorry to Bother You has been creating buzz at film festivals, a surreal, Swiftian satire about a black telemarketer who gets a glimpse of the stranger side of white society. The latest from Gus Van Sant (To Die For, Good Will Hunting) has the unwieldy title Don't Worry, He Won't Get Far on Foot, and it's based on the memoirs of incendiary cartoonist John Callahan; Joaquin Phoenix, Rooney Mara and Jonah Hill star. The newest Spike Lee joint BlacKkKlansman won the Jury Prize at the most recent Cannes Film Festival, and it's a fact-based comedy in which an African-American cop infiltrates the Klan in the 1970s. Based on a young adult novel, The Miseducation of Cameron Post tells of a closeted teenager (Chloe Grace Moretz) sent to a gay conversion camp in the early 1990s. The movie took home the biggest prize at this year's Sundance Film Festival. Fathom Events has become a go-to for revival screenings, regularly showing classic films at the NorthTown and Riverstone Regal Cinemas locations. It continues its festival of films from Japan's Studio Ghibli through the summer, including Pom Poko (June 17-18, 20), Princess Mononoke (July 22-23, 25) and Grave of the Fireflies (Aug. 12-13, 15). Disclaimer: Those last two are decidedly not for young kids. Also on the docket: 1962's Best Picture winner West Side Story (June 24, 27), the 1988 body-switch classic Big (July 15, 18) and the Coen brothers' cult comedy The Big Lebowski (Aug. 5 and 8). Find more at fathomevents.com. The '80s are alive this summer with (from top) The Neverending Story, Dirty Dancing and Sixteen Candles. Wish you were still reveling in the era of DeLoreans and Tab? The Garland Theater's Summer Camp series has got you covered. Amongst the titles you can indulge in during the summer months are the dark children's fantasy The Neverending Story (June 19), the John Hughes classic Ferris Bueller's Day Off (June 26), the musical romance Dirty Dancing (July 3), the 1950s-set coming-of-age drama Stand by Me (July 31) and — more John Hughes — the high school comedy Sixteen Candles (Aug. 14). Tickets are at the positively retro price of $2.50. Find more at garlandtheater.com. Moscow's Kenworthy Performing Arts Centre is hosting a short '90s Nostalgia Film Series, which is bringing more offbeat selections to the big screen. (They've already screened Edward Scissorhands and Fargo.) Upcoming screenings include the Australian drag queen extravaganza The Adventures of Priscilla, Queen of the Desert (June 19) and the feminist fugitives-on-the-run story Thelma and Louise (June 26). Visit kenworthy.org. Your options for outdoor movies throughout the summer are overwhelming (and there's a lot of overlap in your cinematic choices). Riverfront Park's choices run toward mostly recent titles — The Greatest Showman (July 7), Coco (July 18), Black Panther (Aug. 1) — with a couple retro favorites in there: 10 Things I Hate About You on July 11 and The Princess Bride on July 25. Liberty Lake's Pavillion Park is showing a nice mix of recent critical darlings, including Paddington 2 (July 7), The Martian (July 28), Wonder (Aug. 11) and Kubo and the Two Strings (Aug. 17). And the University of Idaho's batch includes some prominent summer movie staples: The Sandlot (June 21), Independence Day (July 5), Star Wars: The Last Jedi (Aug. 2) and Avengers: Infinity War (Aug. 18). All films start at dusk. You might have thought the drive-in went the way of the dodo bird, but there are still a few out there. One is Colville's Auto-Vue Drive-In, in operation since the country's drive-in craze was at a fever pitch in the 1950s. They play double features Fridays, Saturdays and Sundays at dusk, and the film's sound is broadcast over your car's radio. Kids are $3, adults $7 and all cars are $15 on Sunday nights. Enjoy a slice of the past. The Northwest Museum of Arts and Culture is also getting into the summer movie game, serving up a selection of interesting titles (along with beer and wine) in the Eric A. Johnston Auditorium. Films have not been selected as of publishing, but they will be screening on the second Thursday of every month through August. Information will be made available at northwestmuseum.org. The Sandpoint Radius Film Festival is happening at the historic Panida Theater on June 23, screening 20 short films — both narrative and documentary — that were made in and around the Pacific Northwest. The films, which range from 4 to 25 minutes in length, will be presented in three blocks, and many of the filmmakers will also be present at the event. Visit sandpointradius.com. Celebrate Papa Hemingway with a showing of The Old Man and the Sea on Aug. 14. KYRS Thin Air Community Radio has teamed up with the Magic Lantern Theater to show a series of films based on the works of revered novelist Ernest Hemingway. It continues on July 10 with a screening of the 1950 noir Under My Skin, starring John Garfield as a man on the run. 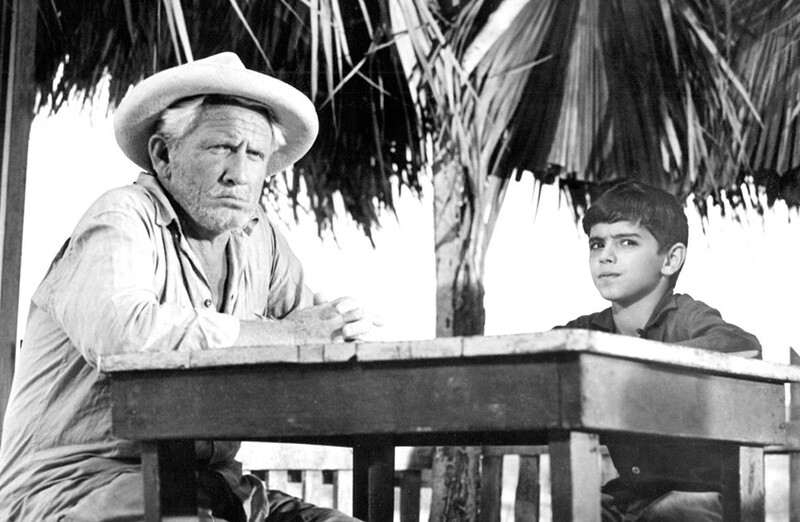 The 1958 adaptation of The Old Man and the Sea, starring an Oscar-nominated Spencer Tracy, will play on Aug. 14. The original print version of this article was headlined "Film | Summer Guide 2018"